At the end of each school year, I always do a culminating project that focuses on French-speaking countries or people. Each year, I've done a different project, but this year I did one that I think I'll be repeating. The objective of the project is for students to describe some facts about a francophone country while demonstrating their presentational skills and digital citizenship. 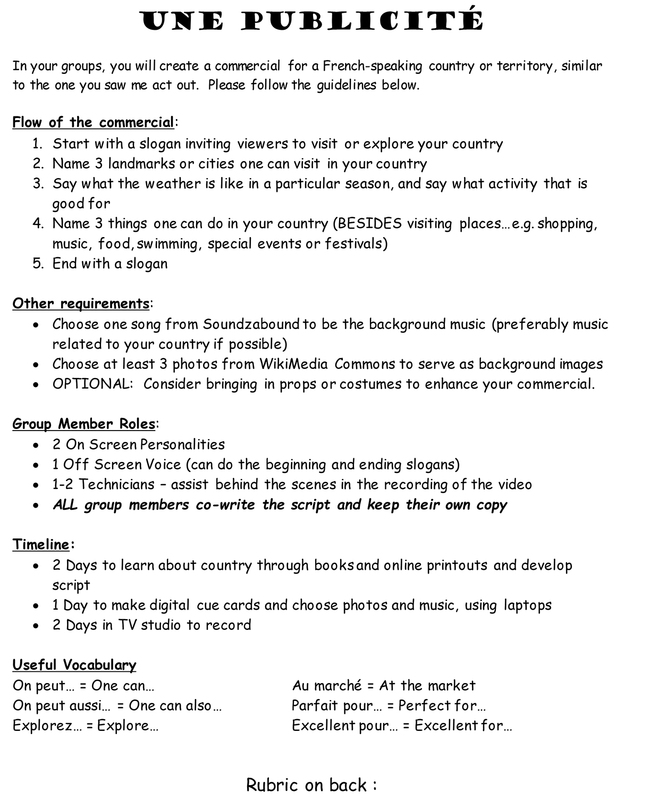 This was met by students working in groups to create a short (approximately 30 seconds to a minute) video commercial advertising a francophone country or territory. Although students took the time to learn about their country through provided resources (in English), this is not a research project. I see it as an introduction to various francophone countries, as I take as many opportunities as possible during the year to show students how varied the francophone world and its people are. After a colleague in my department told me about a project he did working with the school media specialist in our school's TV studio, I decided to try the same. Jamie, our school media specialist, was very excited about the project and worked with the students and I to make the videos. Once the project was completed, the best commercials (as chosen by me) were posted on the class blog, and the 8th grade French students selected a winner to receive a special prize. After watching the videos and showing them an example of what I was looking for, I put students in groups of 4 or 5 and each group picked a country to advertise. Ideally, this project could be done in groups of 2 or 3, but due to availability time constraints in the TV studio and adjoining computer lab, I needed to make the groups a little bit larger. The upshot of this is that students can take on a role in the group that they feel most comfortable in. Two students actually appear in the commercial, one student does an off-camera voice, and the remaining student or students are technicians who help with advancing the background photos and the cue cards. All students are involved in the writing of the commercial. Some students love to be on camera, while others absolutely hate it. I see no reason to force students to appear in front a camera as long as they are contributing to the group in other ways. The first two days that students were in groups, they determined who would take on the different roles, learned about their country through provided books from the school library and online printouts, and then wrote a script. With an upper level class, the content of the commercial could be largely left up to the students, but with my first-year learners, I felt it necessary to provide guidance in the form of an outline of what to say and some key vocabulary expressions. It is here that I will point out that my first couple years of teaching, I was so focused on incorporating certain grammatical aspects or vocabulary items into the project that it was not as authentic as it could have been. In more recent years, I have favored an approach that focuses on making the task more authentic and letting the vocabulary and grammar flow out of it naturally (keeping it level-appropriate). 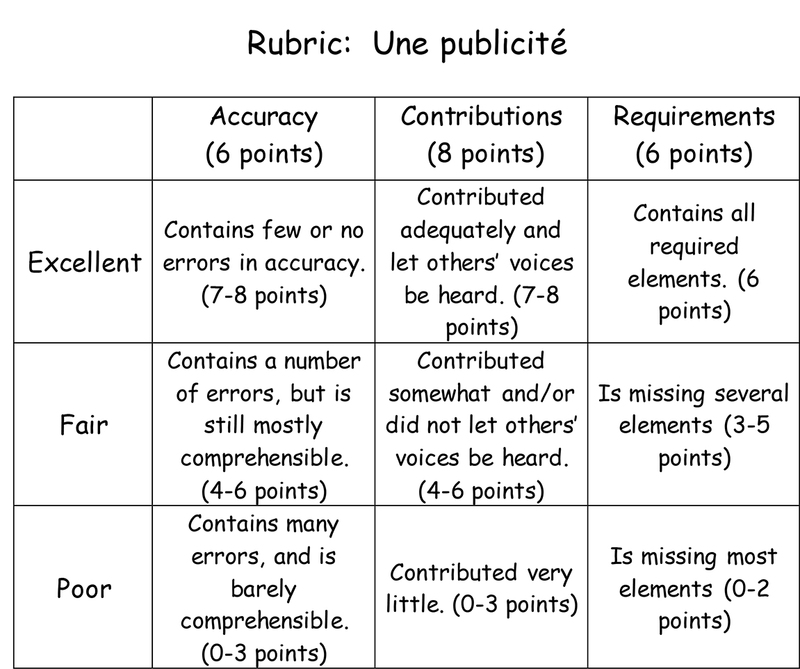 After reflecting a little bit on the rubric, I will add a category for digital citizenship next year, where students earn or lose points based on if their sources are cited correctly. After learning about their country and creating a script, students had one day to use laptops in their group to select background music, create cue cards (students were expected to memorize the script as best they could, but the cue cards were nice to have as a backup), and choose background photos to be projected behind them via the green screen. One day was extremely tight, but luckily the groups that didn't finish had time to work on it the following day while some groups were recording their commercials. Students found background music on Soundzabound, which our school district subscribes to. If you don't have access to Sounzabound, there are plenty of sites to find Creative Commons music that is free and legal for students to use. A few examples are BeatPick (not all music is free, but you can filter your search), CC Mixter, and Jamendo (again, not all music is free here). While one student was doing that, another one was typing up the script as cue cards on a PowerPoint, and another couple students were finding photos. The photos were an important part of this project. For one thing, while looking through photos of their country, students are learning more about the culture and people of that country. Secondly, the photos help make each project unique and original. Most importantly, however, in finding a crediting the photos, students are learning about copyright laws. Before setting students loose to pick out photos, I explained briefly that most images you find on the internet are copyrighted and cannot legally be used in presentations. I explained that some photographers apply a Creative Commons license to their photos, allowing them to be used under certain conditions. I had the students find the photos on Wikimedia Commons. Students had to verify that each image either had a Creative Commons license or was in the public domain (information that is provided with each image), as well as cite the author on a credits slide. While this is a concept that is taught and reinforced in computer literacy classes, I felt it was worthwhile to reinforce it in this project as well, since the opportunity presented itself. Unfortunately, intellectual property law is something that even many adults don't understand (or choose to ignore). As a photographer, this is a topic that is especially important to me. Once all the preparation was done, students got the chance (most for the first time) to see how the school's TV studio works. While groups were in the studio recording (supervised and directed by Jamie, the school media specialist), the rest of the students were in the adjoining computer lab either preparing, or if they were done, working on other assignments I had for them. When students were done, they could either electronically submit a tip for success for next year's students, work on an upcoming assignment, or complete an extra credit assignment electronically in which they answer questions about the country they worked on for the project. I was really impressed with the students' work. I thought the commercials flowed nicely and the pronunciation was good, especially considering that some of the cities and towns in these countries were difficult for English speakers to pronounce. Ultimately, of the finalists in the video above that I posted to the class blog, the first one for French Polynesia won. What set them apart was the leis they brought in to wear, their movement, and the fact that they were able to speak so well while doing the movement! What I gathered from the students' suggestions was that they really enjoyed the project, and in fact they would have liked more time to work on it to make it even longer and more thorough. I can't complain there! While we used the equipment available to us in our school's TV studio, this project is easily adaptable to whatever type of technology you have handy - Apple's photo booth is a great substitute for a green screen, and I'm sure there are plenty of iPad apps that would lend themselves to this type of project. You could even just have your students stand in front of the SMART Board or projector. Not only did this project allow students to meet my objectives, but it also aligned nicely with several Common Core State Standards and ACTFL standards, as outlined below. Connections: Reinforce Other Disciplines (Standard 3.1): Demonstrate knowledge and understanding of content across disciplines. Presentational Communication (Standard 1.3): Present information, concepts, and ideas to an audience of listeners or readers on a variety of topics. All in all, I think this project was a success. Having the students use the TV studio and conscientiously obtain and credit images for the presentation added value beyond just the language and culture. I look forward to doing it again. Have you done a similar project or do you plan to do this in your class this year? I'd love to hear how you might have changed it (I won't be hurt!). Whether it's from students or other teachers, the more suggestions I get, the better the project will be in the future!